Heroes of Might & Magic V represents a new chapter in Freeverse Software’s story. The company is best known for developing and publishing casual gaming fare for the Mac and PC, but this game is a straight-up conversion from Windows. It’s also the first game to have been published using TransGaming’s Cider technology. It shipped earlier this year, but Freeverse and TransGaming only recently ironed out some serious problems with the game’s 1.5 release, which I’m reviewing here. The original release was plagued with game save file corruption issues, memory leaks and other show stoppers. Version 1.5, I’m happy to say, is a much more robust release. Heroes of Might & Magic V is the latest installment of a long-running turn-based fantasy strategy game. We find ourselves on the world of Ashan, a land populated by humans and magical beings. The Griffin Empire is preparing for the marriage ceremony of young Emperor Nicolai to his betrothed, the lovely Isabel. It’s then that the Demons attack—horrible creatures with horns, hooves and fangs that command the very powers of Hell. Nicolai leads his forces into war as Isabel convinces her escorts, Godric and Beatrice, to summon as much help as they can to repel the enemy. You command heroes as they scour the countryside, obtaining control of resources like sawmills for lumber, ore mines and more, hiring warriors, and obtaining control of cities and towns that can be used to marshal vast armies and vehicles of war like ballistae. This plays out over a turn-based system; each turn, you can move your forces through the countryside a specific number of steps, so you must plot out your moves carefully. And if you come across the enemy, you’ll do battle on a grid-based tactical screen—sort of a big game of chess or checkers. 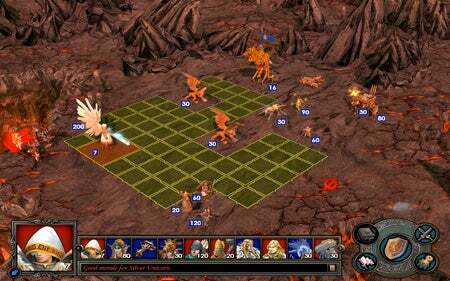 Onward to battle Combat in Heroes of Might & Magic V plays out using a turn-based grid system, like a 3-D board game. The basic gameplay itself will be familiar to ardent fans of the series, and although the developer has changed— Nival Interactive has taken over from New World Computing —it hasn’t messed with the formula too much. What it has done is incorporated a very compelling 3-D game engine that helps achieve a consistent style throughout the game. I like it a lot more than the previous Might and Magic games for that reason—the older games in the series used older 2-D-style graphics. 3-D provides you with a much better situational awareness because you can rotate the map, scale in and out, and reveal things that aren’t easily visible to you at first glance (there’s even a preference to engage “classic” HOMM view, if you want to stay “old school”). Unfortunately, the 3-D camerawork has some really obvious problems when you’re trying to navigate underground dungeons and caves. As a Cider game that operates only on Intel Macs, performance was acceptable on my 2.33GHz MacBook Pro (a late-2006 model), though there were occasional slowdowns. I haven’t had the chance to test the game out on a MacBook or Mac mini with integrated graphics, but Freeverse is proud of the fact that the game runs on those systems, where it doesn’t on comparable PC systems running Windows. Single-player campaigns in the game first serve to familiarize you with game mechanics (as tutorial missions in the beginning), and you get to play alternately as Haven and Inferno forces (good guys and bad guys, respectively). As you travel the maps through each level, you discover a wealth of resources to exploit, from peasant farmers seeking greater glory as soldiers to fantastic creatures like griffins and demons. There are hundreds of units in all, each with unique abilities. Along the way you’re tasked with capturing towns and fortifications which you can use to build up your forces, hire new heroes and send them with troops into battle, and create specialized units such as cavalry, bowmen and machines of war like ballistae (ancient catapults that launched huge stones at the brick walls of castles and forts). The game features multiplayer capabilities, and, now that the 1.5 release is finally out in the world, you can play against PC players. That’s a relief: Previously, Mac users were relegated to playing against each other online, even though it would seem at first blush that the Cider technology used to make the game work on the Mac (by encapsulating a Windows binary with that code necessary to play on Mac OS X) wouldn’t have those sorts of compatibility issues. It’s perhaps worth considering that Heroes of Might & Magic V was TransGaming’s first public effort to “ciderize” a Windows game, so there has been a learning curve involved—it hasn’t helped that the earlier build of HOMM V was plagued by bugs that affected the Windows version, and that obviously affected the Mac version too. Heroes of Might & Magic V 1.5 is a solid strategy game that moves the legendary series in incremental new directions. Since this is TransGaming’s first major game conversion attempt, a certain level of patience has been necessary to allow the game to get to a point where it’s solid enough to recommend. If you’re willing to put up with performance problems on all but the very fastest Intel hardware, you’ll enjoy this turn-based strategy game romp.